Uniquely positioned beach bungalow with incredible ocean, city light and sunrise views. 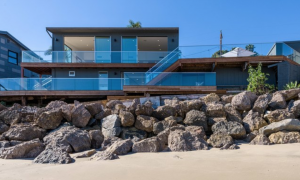 This newly redesigned beach house sits on approx 90 ft of frontage making the property a true Malibu gem and a perfect oceanfront weekend get-away. This surf break is one of the best kept secret beach-front neighborhoods in Malibu. Don’t miss the opportunity to own your spot in paradise.